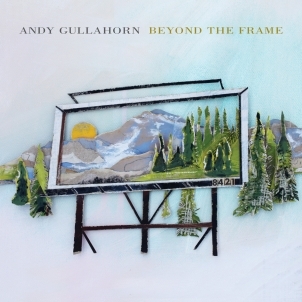 It was here a week ago that I listened to Andy Gullahorn‘s new album Beyond the Frame. I was instantly hooked and actually haven’t been able to stop thinking about it. It took me by surprise because I had heard several of the funny songs that he’s kind of known for, ones that sort of poke fun at people or things in a generalized way (and in the nicest way possible, of course!). And I had known that he’s married to Jill Phillips, someone who I had listened to quite a bit maybe 10 years ago. I vaguely recall from the liner notes of her older CDs (haven’t dug them out to revisit & check) that he had written some of the songs and played guitar. Without taking any credit away from Jill, I’m guessing from reading the credits of Andy’s current CD that he was involved in the production and other instrumentation as well. I then, as luck would have it, I got to see him play with Andrew Peterson (something he does often, but not the previous times I’d seen AP) several days after that first listen to Beyond the Frame. I nearly cried at his live version of “Sleeping Sound” that night. The show was good timing, because I was able to buy the CD at the event. I should have bought two, one to give away here, because it’s that good. At least I think so, but I’m a fan of singer-songwriter/story-based/folkish music. The songs were written for real people going through real life, and I can think of no greater gift than to create something from your heart for people and then give it to them. Last night I read some beautiful words about life and death from Russ Ramsey, someone who recently had open heart surgery (there are 3 parts). I wanted to save & share some of the things I’ve been thinking about lately, so this is just that. This entry was posted in books, music, sharing. Bookmark the permalink.